(Updated June 13) Those awaiting results of June 2017 Environmental Planner board exam can find here the complete list of passers, top 10 (topnotchers), top performing schools and performance of schools as the Professional Regulation Commission (PRC) and the Board of Environmental Planning released official results on Tuesday, June 13, or in two (2) working days after the exam. As announced, 739 out of 1,739 passed the exams. 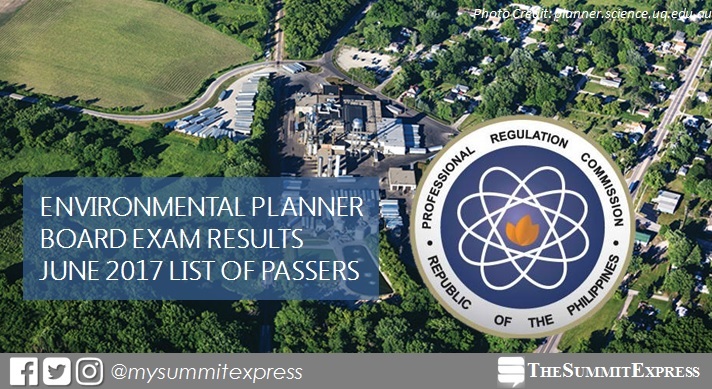 The Environmental Planners board exam was administered on June 7 and 8 in the cities of Manila, Baguio, Cagayan de Oro, Cebu, Davao, Iloilo, Legaspi, Lucena, Pagadian and Tacloban. According to the Board Law, environmental planners are those concerned with the management and development of land, as well as the preservation, conservation, and rehabilitation of the human environment. Per PRC Resolution No. 2016-1019 which deals with the 'Schedule of Licensure Examinations for Year 2017', the target release of recent Environmental Planner licensure exam result is on Tuesday, June 13 or in just 2 working days. Wating time was prolonged as Monday, June 12 is a regular holiday for Independence Day. In the same period last year, results were also announced in 2 working days. A total of 542 out of 1,010 (53.66%) passed the exam. Kim Robert Cuevas de Leon from University of the Philippines (UP) - Diliman topped the board with 83.50%. It was followed by Maria Teresa Salas Alambra, also from UPD, garnering 82.60%. In June 2015 exams, PRC released results after 3 working days. The commission named 178 out of 357 who have passed the exam. Cid Leandro Miranda Jacobo of Ateneo de Manila University (ADMU) was the lone highest placer after obtaining 80.05%. Here's the quick overview of Environmental Planner board exam in the past six years. In few days after the release of results, all takers may verify their ratings online through the official website of PRC. It will be available on this page. Just enter the required information in the appropriate fields to verify your identity. The Summit Express will update this page immediately once the results are out online.